The New Zealand made Incept Pacific tandem inflatable sea kayak is probably priced out of the realm of reality for the time being due to current exchange rates with the Kiwi monetary unit, and thus we won't be stocking them at all. When the situation changes we may carry them again. For now they are special order with a deposit required, and cannot be ordered via our shopping cart - you need to phone us. 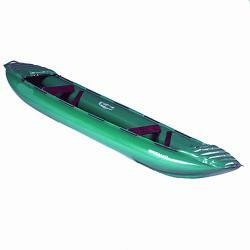 The hull speeds are excellent due to both their hull shape and the rigid inflation level they attain, and they will even beat a number of slower plastic sea kayaks. Incept even includes a very heavy duty wheeled carry-on bag for travel purposes. The stowed size and weight makes the Pacific more portable by far than the tandem Innova Seaker that we used to show in this section of our site (Innova dropped the Tandem Seaker), though the price point puts it above the few other comparable models form Europe. The Pacific's suitcase bag is too big in at least two dimensions (and maybe all three) for what most U.S. airlines mandate as maximum carry-on sizing, but it is quite moderat in size as far as checked bags go. It measures 14" X 15" X 29" to 30" long, with nothing in the side pockets. We should mention that it will take some practice and the proper folding technique to stuff it back in the bag though. Along with the ease of transport, another very strong selling point for the Pacific is the ability to open the decking for camp gear storage. This makes it easier to load by far than either the Seakers or the Grabner Explorers. 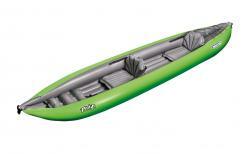 The side tubes are a stacked "double-tube" affair like what is used on the Innova Helios models, which opens up more interior width than a comparable kayak with single-tube sides. 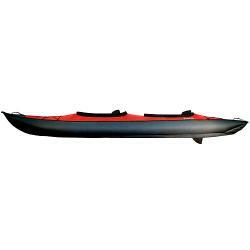 Unlike any other brand, both the floor and the side chambers on the Incept sea kayaks utilize pressure relief valves to help prevent I-beam blowouts. The tandem Pacific is $3,679. Please note that these prices include the suitcase mentioned, the full rudder system, patch kit, bowed fiberglass supports for the spray decks, drybag (or sometimes a Bravo footpump instead), inflatable seats & footrests, and spray deck covers/skirts. Also understand that the price shown can adjust upward or downward mid-season due to constantly fluctuating exchange rates. Unfortunately we do not update often enough to keep up with it, so use the price as a ballpark figure only. Set-up times for this Incept sea kayak is better than it was with the Innova Seakers mentioned up above, and about the same as the Austrian made Grabner Explorers (which are another vaguely comparable line). The Pacific takes a full ten minutes. 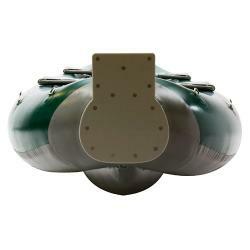 This can drag out longer with any inflatable if you are using an under-qualified pump of course. The foot controlled rudder and linkage are both removable, and there may be times you don't want this hardware in or on the boat. Personally we would take it out before putting these on a plane, and also if we were playing in the surf - though any boat this long and skinny is hardly an ideal surf toy. For normal use and roll-up, you will just remove the actual rudder fin. The rudder pedals are mounted to a small inflatable pillow, which can slide forward or backward to accomodate taller & shorter paddlers without untying or re-adjusting the rudder cords. The rear paddler is always the control person on tandem kayaks. Some people may paddle these occasionally without the sprayskirt covers, but assuming they are in place and you capsize, there are a couple ways to get out of the Tasman & Pacific: Loosen the waist drawcord on the skirt portion, or undo the zipper that runs down the center. This makes these safer than the Innova Seakers, which are still pretty good with their large cockpit openings. But it makes them waaaay safer than any hardshell. Color fastness in any pvc, pvc blend, nitryl, or neoprene will not be quite as good as true hypalon, so it's best to wash your Pacific off after salt water paddling whenever possible, and keep it covered if it will be on the deck of your yacht. Grey colored Tasmans & Pacifics are available by special order with a deposit. The Pacific has 31 D-rings total. Any accessories purchased with your boat are 10% off. Our shopping cart as yet does NOT reflect these discounts, but with this boat we will not accept online orders - you need to phone us at 925-820-BOAT. The Innova Solar 410c is back with a super low price! Nice performance and optional sprayskirts! Row it, paddle it, or outboard-motor it!